Get a taste for the top sights in Osaka as you visit the renowned Osaka Castle before heading out on a scenic river cruise where you’ll enjoy top-notch views of some of the city’s other top sights. It’s the perfect opportunity to get an overview of the history and unique attractions of this unexpected Japanese metropolis. Start by meeting your guide around midday at the Hotel Granvia Osaka, where you’ll head to the subway to take a quick ride to Tenmabashi station for a visit to Osaka Castle. This immense defensive structure, first built in the 16th century, offers an impressive landmark that towers above the area’s surrounding park. It’s a particularly scenic spot during the spring, when Japan’s cherry blossoms are out in full force. Head inside the Castle, where you’ll have a chance to explore its unique 3D exhibits, holograms and other intriguing displays illustrating historic Osaka. You’ll also see the many relics left behind by the Toyotomi, who were responsible for the castle’s construction. 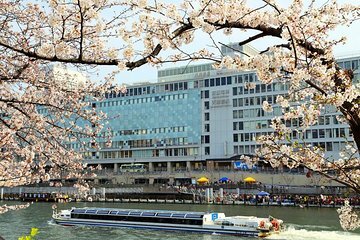 Continue next to the riverbanks to begin your cruise of the waterways of Osaka. Climb aboard your ship, the Aqua Liner, for a 1-hour cruise around Osaka’s Nakanoshima lsle, checking out key landmarks such as City Hall, the Umeda Sky Building and Osaka Castle. Depending on the time of year, you may also be able to see beautiful displays of autumn leaves or blooming cherry trees in spring. Finish your board ride and climb back on land with your guide, heading to Osakajo-Koen station for the return ride back to your starting point. Proceed from there back to your hotel. The tour is a walking tour, so please wear comfortable shoes. Osakajo-Koen Station may be used in place of Tenmabashi Station in some cases. Although our tour guide was nice, she was not very knowledgeable about Osaka. During our 30-minute walk to the Osaka castle, she offered very little information about the buildings and parks that we passed by. And when I asked her questions about the city's history and landmarks, she did not seem familiar enough with the city to give specific answers to my questions. When we got to the Osaka castle, she waited outside, while all of us tour participants went inside to tour the castle on our own. And when she brought us to go on the river cruise, she did her best to tell us what she knew about the sites along the cruise route -- but there was already a pre-recorded tape of a different tour guide blaring over the ship's speakers, explaining the sites in both Japanese and English. So we could not even hear our own tour guide over the blaring speakers. 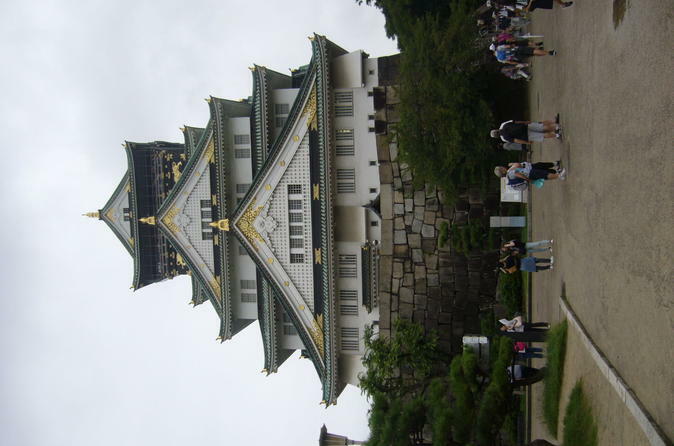 I was hoping to gain more knowledge and appreciation for Osaka by taking this tour, but I think I would have been better off just going to the Osaka Castle and taking the river cruise on my own. This tour was great because our guide Yuki was very knowledgable about the history of Osaka and other facts about the castle, this tour only consisted of a tour inside the Osaka Castle, in case you might wander around the castle grounds you have to do it some other time since this tour has time constraints. After the Osaka Castle we headed to the river cruise, for me it was just OK, i honestly got a little bored with it as there is not much interesting to see, or maybe if they provided a great audio guide on the building and places we passed by that would have been great. Enjoyed the walking tour! Tour guide was very helpful and gave us good information and overview about the area. The tour guide was very helpful in sharing her insight and knowledge about Osaka and its various districts/neighborhoods. The tour guide was ensuring that we had enough time at each site and that we were being informed and enjoying the experience. Amazing from the top floor of Osaka castle. Nice relaxing cruise along the river. The guide was amazing. Enjoyed the tour very much, particular the Noji castle tour. Guide spoke good English and was very knowledgeable. It's been a while since I did this trip, but I still remember it. Quite a bit of walking, but worth it to see the beautiful Japanese castle and to efficiently get around the historical area in a limited time. It was a lot of walking especially we had young children with us. It's a good tour to see the sights in one trip. We were disappointed that we paid about 85 each for a 25 minute visit to Osaka Castle and a boat ride in the river. Part of the problem was that a whole-day tour joined our afternoon tour and we had to wait for them to finish a late lunch. Still, had they been on time, our castle visit would not have been much longer. We would have been better off to go to the castle on our own and explore the grounds and all the floors at our leisure. The boat ride was ok -- probably breathtaking during the cherry blossom season -- but nothing special. Our guide was friendly and helpful, but given the time constraints, couldn't do much about the situation. The tour guide was useless. He was in a terrible stress the whole time and did not speak to the group or explain anything I'm not sure he could even speak English?. This was the worst tour I have ever been on anywhere. This was supposed to be a walking tour and he literally ran, causing great distress to the slower members in our group. There were too many people booked on the tour for one person to handle, especially when catching a train. We were left to do the castle completely on our own with no explanation, and the commentary on the boat tour was not in English and we couldn't hear it anyway, so we had no idea where we were. Everyone on the tour was disgusted and laughing at how bad it was. We would have been far better doing this tour on our own which we literally did anyway! - it was a complete waste of money.